We are a group of students who have a passion for all things related to nanotechnology! Getting involved in research as an undergrad is a great way to gain skills for a future career and apply what you have learned in class. The best way to get involved in research is to look up topics that interest you and find professors who do research in that area. Many are more than happy to have an enthusiastic student to work in their lab. 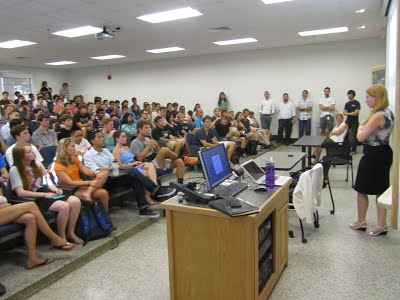 Throughout the school year, we host talks for many different companies. Past companies include BAE Systems, Micron, and SpaceX. By joining NExT, you'll have the opportunity to learn more about a company's current endeavors, and the opportunity to network with people from these companies. We are here to support you in any endeavor you decide to take. Every NExT member will have access to state-of-the-art equipment and professors in their field of research. We'll help you learn skills that will take your research to the next level. By joining NExT, you'll be part of a group of students that have a desire to learn and do something meaningful. Whatever you need help with, we provide materials and mentorship that will help you succeed. Our team works to provide each student with a NExT experience to match their interests. We have professors and graduate students that are always happy to help with any project you have. Fill out the form below! You'll receive updates on NExT events and research opportunities. Make sure to like us on Facebook!